How have you settled into Holby? Has it been at all daunting joining such a well established show? Yes, well it’s always daunting to join any establishment for the first time. You want to do a good job and get on with the people you work with. Luckily, everyone at Holby have been incredibly warm and welcoming so it has taken me no time at all to feel part of the gang. What are the rest of the cast like to work with? Brilliant. All very skilled at what they do and it’s been fascinating to watch and learn from them. It’s a big job and you have to be energetic and calm all at the same time. They are all great fun and hard working.. everyone is cast so cleverly so it makes for a very balanced atmosphere on set. 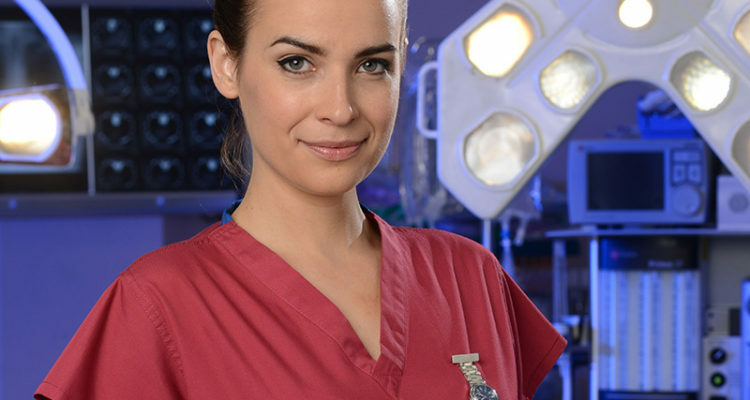 Is Holby your first regular TV role? Yes it is.. I have been lucky enough to do a variety of small parts for stage and screen up until now. But, this is my very first regular character. What can you tell us about your character Zosia? She is cool and collected. Precociously bright and doesn’t suffer fools. She has no filter and can come across as unfeeling but I think she is just very matter of fact and obsessive about her work. You soon understand why she is so robotic. It is a wall of protection but I can’t really tell you why because that would give too much away. I can, in that, I suppose I too can be quite driven and blinkered. I don’t really tolerate flakiness in others and tend to shut down when faced with it. Otherwise, I would say I am much more relaxed than Zosia and like to goof around. What’s her first shift like? Great! I think she is just itching to get started and show off how brilliant she is. She also sinks her claws into a poor young man but I can’t say who! How does she interact with her colleagues? As I say, she has no filter and doesn’t really care about how she is perceived by others. She just says what she thinks and moves on. I think she has little social awareness and avoids building relationships due to her past experiences. 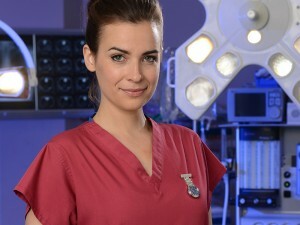 Any plans for a love interest for Zosia? I’m sure there are but I have not been informed as yet. I auditioned 3 times for it. I had just come back from LA and was called in to meet with the casting directors. The character breakdown was so fascinating I was itching to get it. Then I got called in again to meet with the producers. Then the final audition was on set in scrubs with what seemed like about 12 people watching! It was terrifying as they gave me huge speeches to do! It was a real challenge. I remember I was shaking by the end. How did you celebrate getting the role? I went out for a fun dinner with my friends. How have your family and friends reacted to you joining Holby? Have they been supportive? They have all been incredibly supportive. They know how difficult this industry can be and they have seen me struggle with part time jobs and auditions etc So to get such a great role with the BBC is considered a huge achievement and they are very happy for me. I did a lot at school and at Edinburgh University. After Uni , I wanted to get on with things and try and get an agent on my own without going to drama school so I put on a play with a few other actors who were also looking for agents and we managed to create a sell out show in a little pub theatre in Barons Court. Amazingly, we all got signed and I have been with my agent at United ever since. How have you found learning all the medical terms? Tricky. But you get used to it. It’s very interesting what we are talking about so that helps!! Have you had to do any job shadowing in a real hospital in preparation for your role? Yes, just before I started filming I shadowed a consultant for the day. They took me into theatre to watch open heart surgery which was just extraordinary. Before hand, I was concerned I might faint from all the blood but actually once you’re in there it’s so mesmerising you just stand there and stare. Will you be watching your first episode? Yes I will. My friends are very kindly having a little screening at their house so I will go along to that and probably have a large glass of wine! It’s exciting but also nerve wracking. Holby has such a huge following I just hope the audience will enjoy this new character, Zosia, as much as I love playing her. No Comments on "Camilla Arfwedson Interview"